Last Friday I visited the U.K.'s most popular animal attraction: Chester Zoo. In my line of work, as an anti-captivity campaigner, I have to ensure that, from time to time, I visit the very places that I so vehemently oppose in order to ensure that my organization has access to the most up-to-date and relevant information. At the end of last week, it was announced that Chester Zoo had been voted the U.K.'s number one animal attraction and, given that the zoo is less than an hour from my office, I figured there was no time like the present and spent the day there at the end of last week. I intend to write more about the visit in general and the specific concerns that I had about the zoo, but this post will focus on the very first thing that I registered when I began my visit. The zoo is laid out so that the "charismatic megafauna" are in key positions and, like many zoos, the elephants are one of the first animals that you will find upon entering. As it was just after opening time when I arrived, there were crowds of people in front of the elephant enclosure and so the first thing that grabbed my attention while I waited to look at the animals themselves was a sign with the heading "Why is that elephant moving her head from side to side?" "Stereotypic behaviors" are repetitive behaviors with no obvious function. In animals, they might include rocking, pacing, head-nodding, swaying and over-grooming, amongst other things. Stereotypic behaviors are widely accepted as being a sign of psychological distress or even the external symptoms of mental illness. In short, the presence of stereotypic behaviors can be a sign that there is something very, very wrong with the state of mind of the animal demonstrating them. Vitally important to note is that stereotypies are not witnessed in animals in the wild. It is therefore thought that it is captivity, or some aspect or aspects of captivity, which are the direct cause of stereotypic behaviors. To put it in very simple language, keeping certain animals in zoos can make those animals mentally ill. While I oppose the captivity of all animals in zoos on ethical grounds, I accept that some animals may fare worse than others from a welfare perspective when held captive for their entire lives. 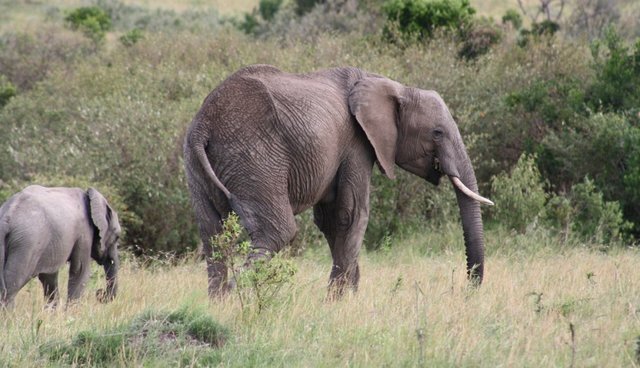 This may be due to a number of factors but, for elephants, it can be attributed to factors such as their huge size, their complex and profound social interactions with others, their huge natural geographical range, their high level of cognition and their very specialized biological requirements. When you consider how elephant societies function in the wild, how elephants live when they are left to experience life as they have adapted to over millennia and compare that to the impoverished existence they eke out in zoos around the world, it is perhaps hardly surprising to find that elephants are one of the animals that are prone to developing stereotypies. Do you bite your finger nails or smoke? These are bad habits. An elephant moving its head from side to side is a bad habit. As everyone knows, bad habits are hard to stop." The zoo went on to blame any stereotypic behaviors on the elephants' early life -- saying that these "bad habits" began at the zoos that the elephants were housed in before; implying that no elephant born at Chester displays such behavior. It would be interesting to see if this is the case, given that four of the elephants currently at the zoo were born at Chester. That aside, it was the description of stereotypies as "bad habits" that struck me. Repetitive, compulsive behavior or stereotypies are recognized in both human and non-human animals. It is particularly apparent in some people with autism. In humans, like in non-human animals, they can be indicators of serious mental distress or impairment and, in and of themselves, may have a marked effect on other areas of development. Stereotypies in children with autism, for example, are suggested to be barriers to attention and learning. Would the zoo dismiss stereotypic behaviors in autistic children as "bad habits"? I doubt it somehow. While it is unarguable that bad habits can be both difficult to stop and, like smoking, can threaten our health, describing a recognized mental health issue as a "bad habit" is both misleading and offensive; particularly when the true explanation behind stereotypical behavior in animals in zoos has been accepted, even by the zoo industry, for many years. Stereotypical behavior is caused by captivity. It is zoos themselves that cause stereotypical behaviors. Stereotypic behavior. Elephant at Chester Zoo, June 2014 I don't know the name of the elephant I was watching but the last elephant to be brought in to Chester from another zoo arrived in 1994 from Flamingo Land. 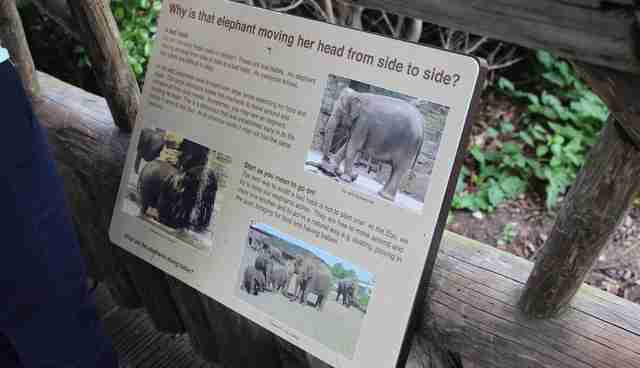 If the offending sign is to be believed and none of the elephants born at Chester show stereotypic behaviors, then it is safe to assume that the female I watched has shown these behaviors for at least 20 years. Twenty years, and the signs of distress are still painfully apparent. This elephant may live until she is 70. Please just take a few moments to think about that. Think of all that you have done in your lifetime, and the plans you have for the years ahead. Think about a whole lifetime of activity; to be born, grow up, go through school, get a job, make lifelong friends, perhaps have children of your own, perhaps even grandchildren. Think of all the individual experiences you have had and will have, the places you have been and will go, the people you have met and will meet. It's impossible to capture these thoughts in their entirety. Our lives are just too immense, our experiences too complex. And now think about the elephant again. In the time it takes for us to live our entire lives, elephants like the one I stood and watched will be stuck in the never-ending monotony of the same routine, in the same zoo enclosure, with the same captive companions. For up to 70 years. Is it any wonder that these complex, intelligent animals go out of their minds? In twenty years from now, the elephant I saw may well be standing in the same place in the north of England, swaying from side to side, as visitors read the sign telling them about her "bad habit"; the sign which belittles her suffering and consigns it to the same category of importance as "nail biting." In truth, it is our bad habit that keeps her there and our bad habit that means that more and more generations of elephants will be born into zoos for decades and decades to come. The bad habit is our desire to see wild animals up close, regardless of the sometimes devastating impact that this desire has on the animals themselves. It is a habit which really isn't so hard to stop. If you care about animals, don't visit the zoo.